QUITO (Reuters) - A volcano perched atop one of Ecuador's Galapagos Islands erupted in the early hours of Monday, the local authorities said, potentially threatening a unique species of pink iguanas. The roughly 1.7-kilometer (1.1-mile) high Wolf volcano is located on Isabela Island, home to a rich variety of flora and fauna typical of the archipelago that helped inspire Charles Darwin's theory of evolution following his 1835 visit. 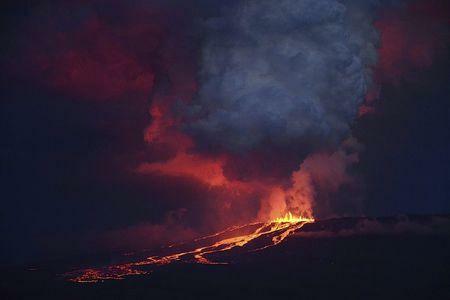 "The Wolf volcano is not located near a populated area. There is not risk for the human population. This is the only population of pink iguanas in the world," Galapagos National Park said in a posting on Twitter. The park posted pictures showing lava pouring down the sides of the Wolf volcano, the Galapagos' highest point, while a dark plume estimated to be 10 km (6.4 miles) high, billowed overhead. Wolf had been inactive 33 years, according to the park. The lava is flowing down the volcano's southern face while the iguanas, officially an endangered species, inhabit the opposite side, the Environment Ministry said in a statement, adding it expected the animals to escape harm. The flow is likely to reach the sea, however, where it could harm marine life, the Geophysics Institute said separately. While populated areas of the island are safe from the eruption, the institute said some of the ash cloud could descend upon them. In April, unusual seismic activity was also reported at the Sierra volcano on the same Isabela Island, the archipelago's biggest, where yellow iguanas and giant turtles also live. The eruption in Ecuador comes on the heels of eruptions in Chile, another South American country located on the so-called Pacific Ring of Fire.